Despite President Kiir and Vice-President Machar’s call for calm, hundreds have been killed and thousands displaced in Juba over the past few days. 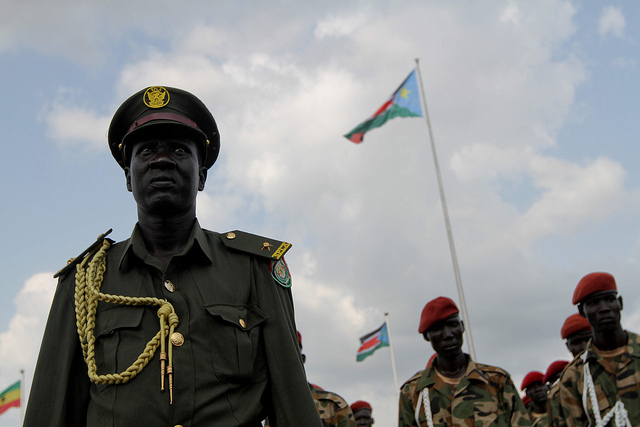 South Sudanese soldiers on the country’s Independence Day in 2011. Credit: European Union. As heavy fighting has erupted in the capital Juba over the past few days, leading to hundreds of deaths and the suggestion that South Sudan is “back to war”, the question on everyone’s lips has been: who is behind the violence? This question is all the more curious given that President Salva Kiir and First Vice-President Riek Machar − the leaders of the main rival factions in the recent civil war − were together for a press conference when one of the episodes of gunfire occurred and both seemed incapable of explaining what was happening. One figure who was notably not there, however, was the ruling SPLA’s Chief of General Staff and former governor of Northern Bahr El Ghazal, Paul Malong − a figure that many see as the true power behind the Salva Kiir’s presidential throne. I have written about Paul Malong and Salva Kiir’s relationship in other publications, and I have come to the unsurprising conclusion, as many South Sudanese have, that Malong is the one that holds the real power. Malong established his authority over Northern Bahr El Ghazal and the SPLA during the civil war that spanned from 1983 to 2005. In this period, Malong dominated the local war economy and used its proceeds to cement strategic allegiances. He did this through the practice of large-scale polygamy and by godfathering his supporters’ marriages. One of those supporters was Salva Kiir, whom Malong provided financial support after Kiir fell out with then SPLA leader John Garang in 2004. One bit of anecdotal evidence that points to the supremacy Malong developed over Kiir is that he recently offered to pay for the bride wealth for Kiir’ new wife, a role traditionally taken up by a groom’s father and his close and extended kin. In 2005, after Garang’s death, Kiir took over as Vice-President of Sudan. And in 2008, Malong was appointed state governor of his home area of Northern Bahr El Ghazal. In the following few years, as episodes of fighting with Sudanese forces continued, Malong managed to convince Kiir of the need to create a militia that would be loyal to them both. He took advantage of the economic disarray in his home region and began recruiting and training men into this new fighting force. Some members originated from Kiir’s home state of Warrap, but the majority were from Malong’s Northern Bahr El Ghazal. Malong was trying to position himself as the first leader from Northern Bahr El Ghazal with national stature. The militia went by the name of Mathiang Anyoor (meaning ‘brown caterpillar’ in Dinka), but was also known as Dot ku Beny or Gel-Beny (meaning ‘rescue the President’). It was financed with the help of Ambrose Riing Thiik, the chairman of the Jieng (Dinka) Council of Elders (JCE). In December 2013, war broke out in now-independent South Sudan. It began as a political battle between President Kiir, an ethnic Dinka, and Vice-President Machar, an ethnic Nuer, but much of the violence soon became codified along these ethnic lines, despite the fact that military alliances did not always follow strict lines. As the fighting broke out, Malong, with the help of the Mathiang Anyoor, organised the massacre of thousands of ethnic Nuer in Juba. Soon after, he was soon promoted to Chief of General Staff of the SPLA, and he came to dominate the entire SPLA system of corruption. He invested embezzled money in various companies and used the resources strategically to sustain military allegiances, both within and outside the SPLA. Since then, Malong has continued to recruit young men in what has become known as the “new” Mathiang Anyoor. And both “new” and “old” Mathiang Anyoor have been used to reinforce the SPLA in Upper Nile, Unity and Jonglei states. But Malong’s influence goes even further. The Dinka commando units that have wrought havoc on Western and Central Equatorians since October 2015 − despite the signing of a peace agreement between Kiir and Machar in August 2015 − also reportedly answer to Malong. Many claim that Malong personally ordered helicopter gunships into Western Equatoria, and it is understood that the power he commands has led to rifts with Minister of Defence, Kuol Manyang. Meanwhile, it was also reportedly Malong who made the decision to move Thayip Gatluak Tai Tai, one of the Bul Nuer militia’s ruthless commanders, to Wau in December 2015. Tai Tai had recently overseen a scorched earth strategy in Unity state whereby at least 600,000 civilians were uprooted, and after he was relocated, Wau became the site of extreme violence and the displacement of a further 120,000 civilians. Over the past few days, violence has also reached Eastern Equatoria, which means that since the signing of the peace agreement in August 2015, three more states have been engulfed in the war. In contrast to Malong, the influence of South Sudan’s official main leaders appears to be weak. The recent fighting in Juba and Kiir’s apparent ignorance of what was happening reveals his lack of control over the SPLA. And it is increasingly clear that the president has lost a great deal of credibility and power amidst rumours of alcoholism and health issues. If Kiir is a lame duck, the same might be said − albeit to a lesser extent − of Riek Machar. The first vice-president never seemed to control his troops and never had as much military gravitas as his peers in the so-called SPLM-In-Opposition (IO). Furthermore, he has made the grave mistake of dismissing IO’s most experienced generals in the past year. With fighting returning to South Sudan despite an internationally-brokered peace agreement less than a year ago, the international community must also take some responsibility. For instance, why did Juba’s demilitarisation take the form of a 25km radius around the city, essentially allowing the SPLA to encircle the capital while blocking possible escape routes for IO? And why was a stronger stance not taken regarding the fact that SPLA soldiers had clearly removed their uniforms but remained inside Juba and that the National Security body had grown exponentially over the past few months? Indeed, the recent violence in Juba has shown how easy it is for the SPLA to breach security arrangements. And the heavy fighting on 10 July suggests that the situation might be even worse than when civil war began in December 2013. Fighting has engulfed different parts of the city such as Jebel Kujur/Rock City, Tongping, and Gudele. RPGs have been fired. Civilian houses have been shelled. Government helicopter gunships circle Juba’s skies. And UN premises have been hit. The Juba bridge is also now closed off and Machar’s IO troops will not back down since they know there is no way out, especially with Malong’s commando units able to attack them easily from their bases in Central Equatoria. IO and SPLA forces are fighting right outside UN premises and reports are emerging that Nuer generals, who had remained allied to the SPLA but are now being targeted by SPLA soldiers, are asking for shelter inside the UN compound. Meanwhile, UN peacekeepers are also trying to defend their bases. Will these two groups end up fighting side-by-side to defend a Protection of Civilians site that is overwhelmingly shielding Nuer civilians? If so, it would be rather uncharacteristic of the UN Mission in South Sudan (UNMISS), which has repeatedly failed to fulfil its mandate of protecting civilians, most shockingly in Unity state, Western Equatoria, and more recently in Wau. In February 2016 meanwhile, UN peacekeepers simply looked on as SPLA troops attacked the Malakal Protection of Civilians compound and burnt down half the site. That episode suggests that the SPLA may not feel compelled to stop at the UNMISS gates in Juba, where over 30,000 civilians are sheltering, and could easily overrun it. Whoever wins Juba will inflict reprisals on civilians, and reports are emerging that both sides have already started doing so. Hundreds have reportedly been killed and if things continue, the death toll this time around might be even higher than in December 2013. Again, the question is: who will protect the civilians in Juba? Many believe that Malong is the one behind the last few days’ events and point to the fact that on 8 July, SPLA troops around J1, the presidential palace, were reinforced from both the area surrounding Juba and from Luri, a cattle camp where Mathiang Anyoor recruits stayed before the 2013 Juba massacre. Malong did make a statement on 9 July saying the situation in Juba was under control, but this was done through an intermediary and it is not clear where the man himself is. Some suspect he is in Uganda, others in Yei, and yet others say he is in Juba itself. At any rate, it is difficult to imagine the SPLA could have decimated Machar’s bodyguards on 8 July without the top orders coming from its Chief of General Staff. Kiir has called for an inquiry into the past two days’ violence, but if previous investigations are anything to go by, the perpetrators are likely to get away. There are rumours that Malong intends to wreak havoc and maybe even take control of Juba. He may also split from Kiir, but either way he will retain control over his Dinka militias, who are spread all over the Equatorias, as well as over some of the Bul Nuer fighters, who are based in Unity and have close ties with Khartoum. Malong will also continue cultivating his popularity with Dinka communities who do not want to relinquish their desire for their own state, especially after Kiir opened Pandora’s box with his unilateral decree in October 2015 to replace South Sudan’s ten states with 28. If Malong does intend to take Juba but fails to do so in the coming days, he may open up a new front, most likely from Northern Bahr El Ghazal. If such a war were to begin, Kiir might break with Malong and be forced to mend fences with Machar’s IO as well as with the Shilluk, Fertit, Balanda, Zande, Moru and other victimised ethnic groups. However, one cannot rule out the possibility that Kiir permits to Malong’s control of the SPLA but then sacrifices him if he has to yield to international pressure. Another factor to keep an eye on is the role of Uganda, which intervened in support of the SPLA in 2013. There are suggestions that the so-called rebel White Army in Jonglei intends to march down on Juba to protect the Nuer and reinforce IO troops, but if Uganda’s air force becomes involved again and drops bombs on them before they reach Juba, the IO might be massacred. Most importantly, the Nuer who survived the 2013 Juba killings, might very well be too. Much remains uncertain, but the future of South Sudan looks grim, and it is not just Juba. Other state capitals such as Malakal in Upper Nile and Bentiu in Unity state have seen troops movements and are incredibly tense. Just five years after independence, and less than one year after a peace agreement was signed, a phase of a third South Sudanese civil war seems to have begun. Clémence Pinaud is an Assistant Professor at Indiana University’s Department of International Studies. Her research focuses on the SPLA’s military history, predation strategies and marital practices. Some say Malong was in the presidential palace in the meeting on Friday when fighting broke out at J1. Please check your sources. Clémence Pinaud, you might be another clueless Western prey fueling the Africa’s wars. Probably the fighters on both sides. In many civil conflicts you end up with the leaders looking for peace, but the actual fighters don’t want to stop. They don’t feel the war is over. Aken Tong, you are right about the author of the article. I just had to read a few paragraphs of the article to realize that he did not know what he w as talking about. I know a few SPLA veterans and some senior Dinka and Nuer figures. The issue of South Sudan is that the current government of South Sudan has refused to obey the American orders, especially, with regard to oil. This is an excellent article. The name Mathiang Anyoor will join the hall of infamy alongside Interahamwe and Janjaweed. I find it extraordinary that so many South Sudanese, both members of the ruling elite and their supporters, are still capable of blaming everyone except their rulers for the total catastrophe that has engulfed their nation. We have often seen liberators disappoint their people. But never in the annals of liberation movements in power can a group have so utterly and comprehensively forfeited the claim to be “liberators” as the leaders of the SPLM/SPLA, whether in government or in opposition. Others have made mistakes and have meddled. But this is a home-grown South Sudanese disaster first and foremost. What a stupid Western writer! Making up stuff from thin air! These are the people destroying our country. Thanks for this professional article. I have no idea of whether you are a journalist or not but you are really great. I admired the truth and neutrality in this article. So what can be done to mean that this doesn’t descend in to all out war? Are there any actions for ceasefire, a better strategy for the appropriate locating of soldiers? It’s unfortunate to see that African leaders still behaving as primitive clansmen. They don’t realize that they have bigger responsibility for their country and its impoverished population. South Sudanese people have been suffering a lot for more than 20 years before they embraced their independence from the rest of Sudan and it’s heartbreaking that after 2-3 years their leaders led them in to devastating civil war in which thousands of civilians and soldiers aimed to defend their country from foreign aggression meaninglessly lost their precious lives. Those so called leaders are merciless enemy whatever card they are using to divide you and shed your blood. They only visualize their narrow personal interests and never see the bigger picture of nation-building. For these critical reasons, I call south Sudanese people to wake up and see your future is not in the hands of murderers destroying your livelihood but is in your hands. The current situation of setting South Sudan on fire has been the work of the leaders and elders (Kiir included). The so-called Dinka council of elders (JCE) running the government of South Sudan has been part of the plan. I have never seen a national government being advised by a tribal bigot, it is only in South Sudan under the leadership of the Dinka elites. I viewed the comments posted on this articles, I realized that majority of Dinka who commented support the rogue regime because they are part of the policies being implemented through Malong. Prof. Jakobiero, you should know that it is the South Sudanese who are dying and not Americans…a whooping 270 of them in two days only. You are deluded to keep blaming your primitive appetite for wars and innocent blood on the westerners. Keep in mind that the peace and destiny of the Sudanese is on their own hands and not on the American or anybody else. Aken Tong you should direct your energies towards finding the root cause of the current war and the incoming one rather than put more effort on blame game. This is a time for more restrained contribution rather than feeding negative and one sided narratives being used to fuel the conflict. We need to take great care and this contribution runs too close to singling-out people in ways that can be used to fuel the conflict. This is time to compel restraint, not presenting imbalanced presentations that risk inflaming. In the current context it is best for commentators not contributing directly to peace to reserve their words for a time when they might not feed dangerous rumours and fears. This is not a defence of General Malong. This is a caution to all of us who are concerned with South Sudan and the current situation. We should ask one question before we publish something – how will this help the current situation. If it will not then it is best to hold commentary for a less tense and dangerous time. Words and messaging from outside are currently being used as justifications for violence. Further, there is significant question of the foundation of the argument being made here. It seems to be based upon anecdote and simplistic anthropological logic by Dr. Pinaud. Is the implication here that Malong was single handedly orchestrating this violence ? If so the fact that he was in the meeting with Kiir, Machar and other senior officials when fighting began raises question of the premise of the article. To argue that Malong is the Eminence Grise of South Sudan seems too grand an accusation to be based upon a few threads of anecdote which outside observers might find curious. Further, contrary to the implication that Malong has been absent from calling for restraint is the fact that he has been included in calls for control and discipline of forces, in numerous forums, echoed by General Taban and Dr. Riek from the SPLM-IO side as well. More problematic is that the article implies Malong is largely responsible for fighting based on the premise that he has had significant importance in wider Dinka society and in particular those from Bahr El Ghazal. I am not sure that amounts to evidence of being the primary director of the violence, especially since he was in the room with the other leaders and under the same direct threat as they. Responsibility certainly falls across a wider spectrum of leaders from wider South Sudanese communities. The fact is the commanders of all sides believe they are fighting a just war in the defence of their communities, facing what they perceive as extreme emergency. The more accurate interpretation might be that there has been a period where the parties to peace agreement may have lost control of elements of forces loyal to them. Explaining this issue will be much more valuable to helping build peace in the months to come. What is needed right is a way to diffuse the tension so these men can refocus on implementing the peace agreement, rather than a moment of crucifixion. A further problematic issue with the contribution is that the main support of the claim that Malong is to blame is his power over Kiir. If this is in fact the case, the evidence presented is thin. That Malong made a bride wealth payment in support of one of Kiir’s marriages does not amount to power over a man. South Sudanese society has evolved and many friends and peers are now expected to contribute to marriage. Today in South Sudan bride wealth payments are expected to attract a myriad of supporters not just one. Such an act certainly should not be seen as proof of power and extortion over someone. This is argument is just too big an accusation to base on the evidence presented here. No doubt Malong is involved and important, he is critical to make any peace deal work, as is General Gatwitch Dual and most other senior commanders who have actual armed men supporting them. Contributions and commentary being made on the internet, in particular on social media are being used to justify and are fuelling violence. I will reiterate my initial point, please unless a commentary is constructive to peace in the immediate, with balance and aimed at easing tensions, restraint is best. There may be value here but such discussion is best kept for an academic seminar or at our usual academic conferences, where no one is holding a gun with civilians and innocents caught in the middle. To present this now smacks of sensationalism. No matter how well intentioned our writing, this week South Sudan is burning, lets at least not fan the flames. I am asking on behalf of all of us who have loved ones in the firing-line. Some Southern Sudanese here are evidently very angry at this writer. Give us your version of the root cause of the war in South Sudan instead spewing out insults at the author of this article. And tell us where you are writing from. Some of you the elites inflame war in your own country and then run to Kenya or Uganda where you live lavishly. Conceptually, academics, if I could buy your status for a second, based their judgments on empirical evidences, not this activist’s view you have been carrying this while. Comparing Mathiang Anyor, which is one of the SPLA’s battalions with a force that has killed million Rwandans in what is today known as one of the world’s worst genocidal forces (Interahamwe) is plainly disturbing. Much as I agree that South Sudan was failed upon birth by corrupt leadership, western misinformation shaping America’s foreign policy flying around since 2005 are also the reason South Sudan, much like any nation on the continent, is slipping this fast down the waterway. As South Sudanese prepare to send these corrupt warlords home or jail now or years to come, this western misguided foreign policy, who side with one corrupt warlord on the right, while blaming the other on the left, just to build his profile from the centre, must prepare to exit this space. Tribalism is the bane of most ” independent African “countries. What the South Sudanese people need desperately now, is for their leaders to put aside their differences and resolve to more the country forward. Innocent civilians including children are dying in a country that has just gained independence! As an African from the most populous black nation living in the US, it is very disturbing and embarrassing to see horrible pictures of displaced civilians and children affected a senseless quest for power! This so called leaders should be ashamed of themselves. Serve your people and leave a lasting legacy for generations unborn! This is what leadership and service is all about. The problem of South Sudan is failed leadership on both sides, impunity and corruption which thrive unabated. You have leaders who have no national ideology but instead perpetuate tribal ideology for their survival. The biggest failure in this regard is President Kiir himself who should lead all South Sudanese to national unity but who unfortunately seems to believe that he is the president of the Dinka community or rather sections of it – viewing other groups as enemies or at best irritants who want to challenge the dominance of his group. I submit that unless the current leaders of South Sudan abandon the primitive politics of tribe/ethnicity, impunity and corruption and instead develop a non sectarian national ideology and reign in on impunity and corruption , then the country will remained trapped in a permanent crisis which might make a mockery of the independence that was got through shedding of a lot blood – making those who died during the independence struggle to have shed their blood in vain!!! Dear beloved brethren in S. Sudan I have no comment on the article. However, have this to say to you; learn to live together. Focus on that which unites than dividing you. The destiny of your new Country lies entirely in your hands. No perfect human society, neither a perfect human person. We are not angels. Sit down and talk as a family. Listen to your inner voice and know that your are God’s own image and likeness. The purpose of God creating us is to be stewards…. good stewards. Thank you. The blame games in war are themselves ‘strategies of war’. What the people will care about is not who is wrong, but that there is peace. The idea that generals should be the determinants and sustainers of this peace is one that assumes the state of South Sudan to be a military Baracks. The question i find most pertinent is the question of disarmament of the militias post the peace process, as well as the administrative controls granted to the different factions that was as recently as yesterday, war lords. I think for South Sudan, there cannot be a solution that lies in ownership of power by some, or the presence of an opposition on the other, the solution lies in a national reconciliation process, that will merge interests and expiate grave differences with nationalism. Until the people feel they are all stakeholders in the peace, the militias will work for money, and the generals, no matter whom, will determine the presence or absence of peace in personal whims. Paul Malong or the government of presient Salva Kiir was not aware of J1 incident. No trained army officer who can wage fighting while the boss is within the range proximity of fighting scene. Style up in your writings otherwise you are misleading yourself and your institution. ruling leaders, try to come how the events are likely the same to such of that( else where country) country. the one thing i also warn you the idol of west(US), please look back the countries your West have initiated this kind of moves(regime change with the oil eyes) behind the lord they subject of a country never worship have never change anything. take a look at Libya regime change…….. then proceed. stop siding if you’re really peace lover, and if you don’t, then continue……… the may change, but your country will never enjoy any change they think for. mark my words. South Sudanese should stop the indifference and egocentrics they carry wherever they are, I have been wondering why many of you have refused to go back home years after independence. You can’t even tell the world why you are fighting but you are very fast at criticizing those who fathom what is happening in your home land. Stop acting as if you are united on the net when actually you are so sectarian. As an important point of chronological clarification wrt LeRiche et al’s comments made above, the CoGS Gen. Paul Malong Awan, was not actually in J1 (the State House) together with the President, the 1stVP and the VP, when the fighting started outside on the 8th July 2016 between the two armed forces. He only went to J1 later after the fighting had stopped and when the statements calling for calm were about to be made by the Presidency on the national tv broadcaster SSBC. Interesting read. My organization recently entered into South Sudan and it will be great to understand such political, power and military dynamics that comprise our opertaing space. This is an excellent article. I am just counting my blessing as I escaped the J1 disaster by the blink of the eye. South Sudanese must stop celebrating liberators who have failed us. Malong and company are responsible for the lives of South Sudanese who just perished in the last days. The war is at the disadvantage of his own people of Bahr el Ghazal. You will not see it now but will be visible once he is out of the equation. See the destruction on the lives of the young boys he recruited in the army; fleeing population to Sudan in search of food etc. I wish he invested his energies on useful things. He is a divisive character as of now. This researcher is a greater writer and critical thinker. He has obtained his information about the evolving political and ethnic issues in South Sudan from incredible sources. His observations and condemnations of such a humiliating policy of the government against certain ethnic groups will remain in long term memories of the victims of this war for generations. I will order your book one day. The problem is the real players are operating a guerilla strategy and unless and a counter strategy is employed to track them down the conflict will continue thriving on. There is chain network and that may extend beyond South Sudan. Until their resource base used to fuel the conflict is cut, they will continue having funds to fund the conflicts. It is really unfair that out of power thirst and greed the people that bear the greatest brunt are the innocent civilians. Oh God help our monster infested world. Amen! This is a very excellency work. It is rich and full of substance. I comment your excellence research and am encouraging you to continue trusting your sources that help you come up with such excellence piece. I humbly disagree with those who advocate that facts shouldn’t be highlighted for South Sudan on such critical time of conflict. What kill South Sudan is tribalism, corruption, and all the hypocritical characters that hold the world’s young nation hostage. south Sudanese needs to be liberated mentality to see the bigger picture of nationhood with all it’s blessing then remaining in their tribal trenches. Such work will help contribute towards that direction. I would have love to see my learnt brother Aken Tong discuss issue and dispute your article base on facts as to why he think Gen. Malong is not a party to current mess. Bursting and blaming the west “missed informed westerner” for all the misgiving of South Sudan is nothing but naive and a serous scapegoating. I was a Director for Policy Analysis at the Ministry of Cabinet Affairs in the Republic of South Sudan before this conflict. Through my department came some interesting Memos to different clusters meeting as well as to the Council of Ministers for decision making by the Cabinet. A Memo to fund and Finance the Training of Mathiang Anyoor in Norther Bhare El Gazel including the purchase of their equipment was submitted but never passed Ministerial cluster stage. It didn’t even reach the Cabinet for decision making because the Ministry of Defence was so divided on that issue. The Chief of General Staff refused point blank to fund an army he didn’t train. That was when General Malong, the then Governor of Northern Bhare El Gazel and who was responsible for training Mathiang Anyoor, decided to footed the whole bill together with the President. If Mathiang Anyoor was a national army of South Sudan; why did one state out of ten states took it up on itself to train and equip a would be national army? This leave a lot to be ask. Aken and Co should explain why? Second the president also went on record depending why a private army was mobilised and train. It is no longer secret and who try to defend it will have difficulty task of stitching it up. The author of this article is biased. She is apparently inferring from the alleged vices of Mathiang Anyoor to drive her points home. It is not convincing at all! South Sudanese were part and parcel of the prolonged war during the Sudan war. However, particular emphasis must be laid on the two tribes (Dinka and Nuer) that were used by Arab government of Omar El Bashir against spla/m during the liberation movement. Also, these two tribes had an ancient inter-tribal conflicts, which became overly magnified during the Sudan civil war. The spla Dinka movement led by late John Garang had already established a tribal hegemony during the war times, which marginalized other ethnic groups. This act of tribal hegemony was conspicuous in the military wing of the movement in which most high ranking Generals were dominated by Dinka. On the other hand, during the 1991 spla split, Nuer (Nasir faction) broke away because of the unnecessary killings of ethnic groups and in particular the 1983 massacre of ethnic Lou Nuer by late John Garang’s movement. Now, to keep the details in summary, after the death of John Garang, his own tribal rival, Salva Kiir took over because of his position, as Vice President of South Sudan and because late John Garang was by default the President of South Sudan, although he (late Garang) was the First Vice President of Sudan. Thus, the continuation of the Dinka hegemony continued through Salva Kiir to date. There has always been internal rivalry within the Dinka elite ruling party and headed by Jieng Council of Elders (i.e., Dinka Council of Elders ). There was also another aspect of the Dinka hegemony, which comes from the ideology, “We are born to rule”, whose architect is Abel Alier who was once the President of High Executive Council of the autonomous Southern Region of Sudan. During Abel’s time, Dinka hegemony was visible and an atmosphere of violence gripped Juba in the early 1980s, which led to demand by the region of Equatoria to redivide (Kokora=divide in Bari language) south Sudan into three region: Equatoria, Upper Nile and Bahr El Ghazal. The re-division was meant for transferring all non-regional citizens to their regions in order to enhance development of their regions. The formation of SPLA/M was partly anti-redivision, although the movement was sparked by a mutiny in Bor due to corruption within the military ranks who didn’t receive their salaries, please see: The Root causes of Political Violence in South Sudan – What’re the Solutions? These understatement of belief system is very damaging to a country that has never recovered from prolonged civil wars since 1955-1972 to 1983-2005 to 2013-2016 and ongoing. i see south sudan nighbours countries specially igad and international communities do not give the rihgt witness to south sudan,but the history it self is enough and will be enough full witness foreve. I thank Clemencve Pinaud( A.prof.) the article stated above is truth.